I knew I had to do something else with the little bit left in my gold leaf pen. A few months ago I was in my basement going through a box of old childhood treasures when I came across a tray from a tea set. Trays are super trendy and can sell for upwards of $30 so when I found one in my basement that has been unused for 10 plus years I decided to update it. First I painted it white. 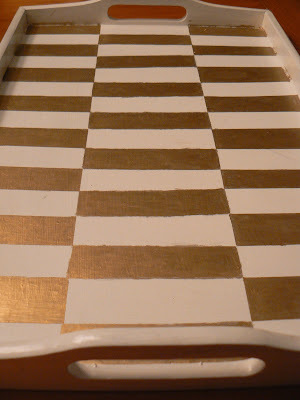 This is a gold leaf tray that was featured on Design Sponge last year. It is $98 – yikes! But I pinned it because I thought it had ‘DIY me’ written all over it. I thought about doing several different patterns like herringbone or stripes but ultimately I was inspired by my surroundings, specifically my living room rug. This is probably because I was sitting on my couch while starting this project. 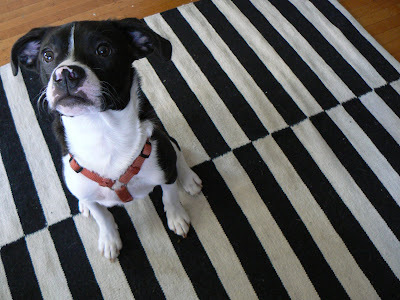 The IKEA Stockholm rug is sort of like color blocked stripes. I figured it would easier than doing something with diagonal lines. I used my favorite Frog Tape to mark off my lines. You may be wondering, did I measure out my lines? The answer is NO. I am waaaay too lazy to measure and I hate math so – ‘eyeballing it’ for the win! I taped and gold leafed the sides first and then I removed the tape. The middle was a little trickier because I didn’t want to risk taping over what I’d just done so instead I used a piece of stiff paper to make the straight edges for the boxes down the center. There is probably a more efficient way to do it but I was distracted by Alias (it’s on Netflix Instant and I’m addicted). 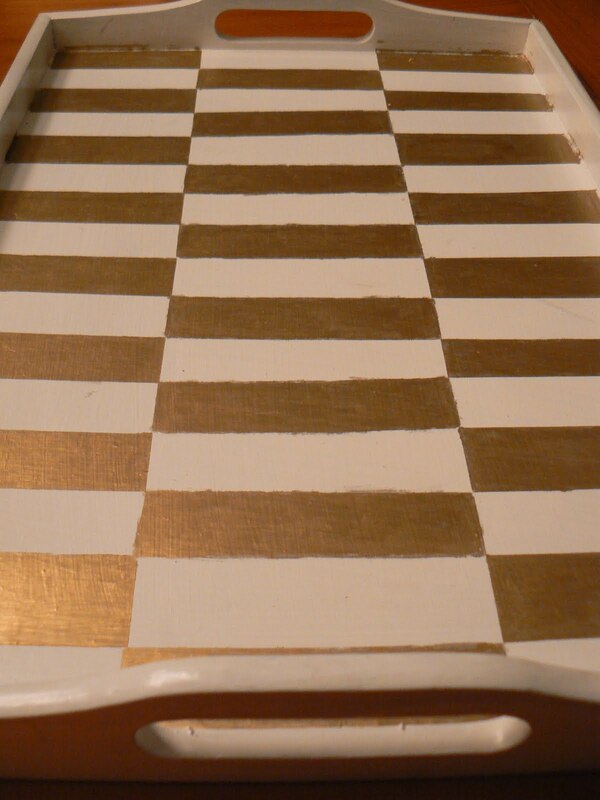 I am so in love with this tray! It really didn’t take that long to do either… about one episode of Alias 🙂 And since I already had everything on hand (the tray from my basement, white paint, Frog Tape, and gold leaf pen all from other projects) it was a completely FREE project. Woohoo! But even if you didn’t have the materials on hand you could do this project for pretty cheap if you shop smart. 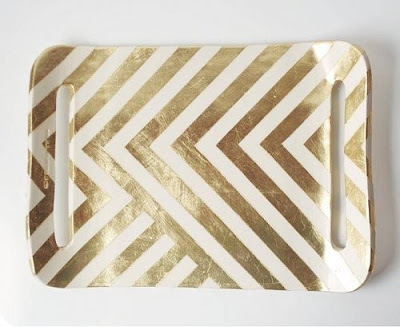 I bet you could find a tray at a thrift shop and most craft shops have good coupons that you could use for the gold leaf pen. Trends are so funny. I remember 10 years ago thinking that people who had gold frames in their houses were so out of touch. I was all like “hello, only black frames are cool.” Oh how the times change. 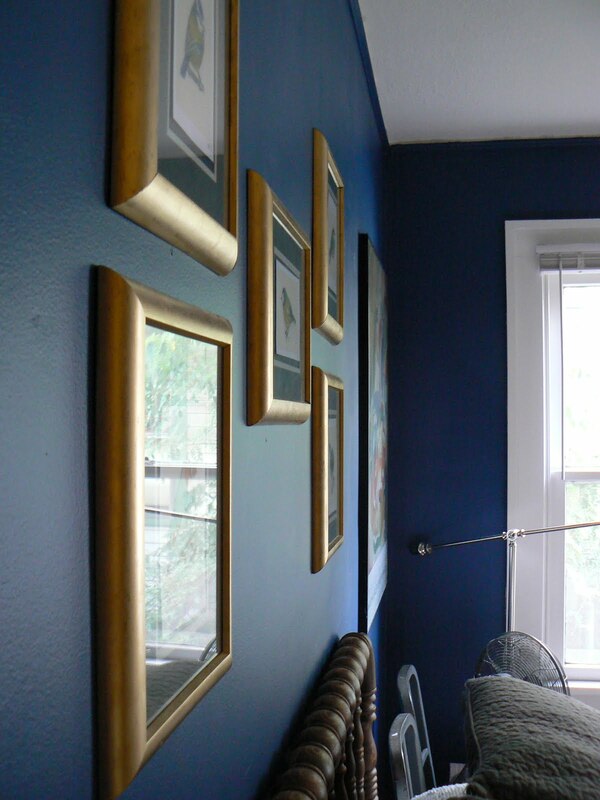 Now it’s all brass and gilded antique frames…I’m loving it. Go figure. 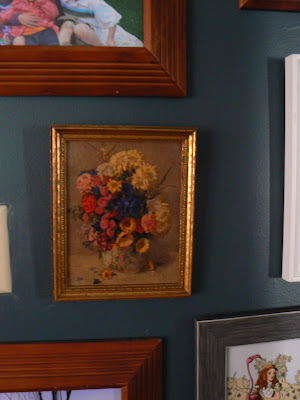 Like I mentioned in this post, I have a lot of different types of frames in my house. 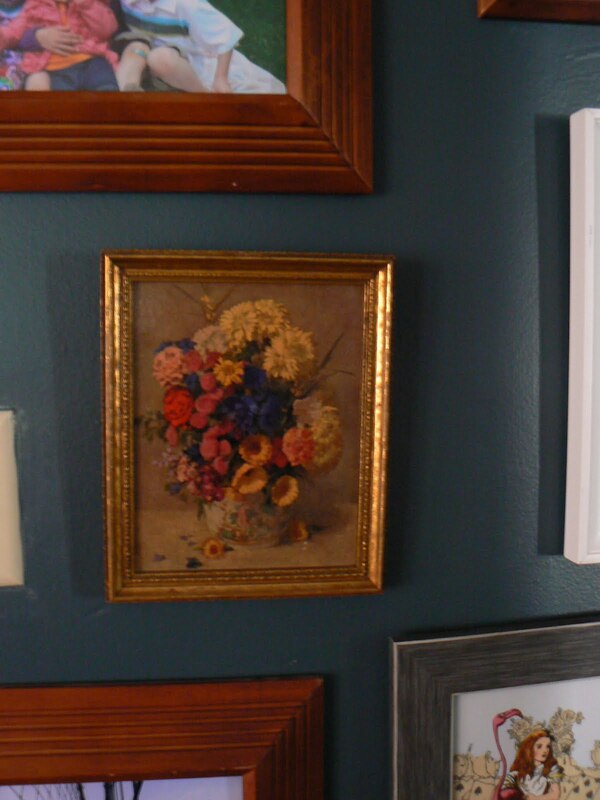 My current favorites are these antique gilded frames from flea markets. 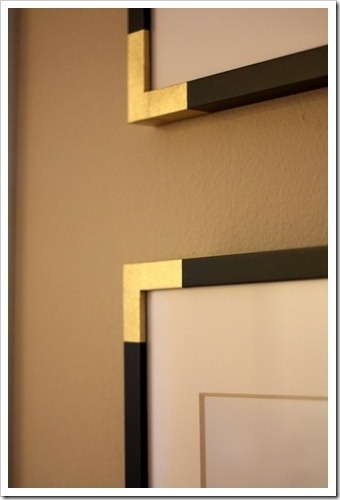 The idea behind this photo is that you can use a gold leaf pen to had faux brass corners to a frame. Such a great idea! I liked it so much that I decided to just gold leaf an entire frame. I found some plastic frames in the clearance aisle at Michael’s for around $4 each. They were a kind of weird sparkly grey color. I also bought two gold leaf pens. I had no idea how much “ink” it would take to cover all five frames. There is really no skill required to gold leaf a frame. I did it while watching TV and talking to a friend. It took quite a long time to do but I am happy with the result. I only needed one gold leafing pen after all so I returned the second one. Good thing considering each pen was $7.99! My technique was to do about 1″ zig zags to cover the frame. Some of the dark grey frame did show through the gold but I like that look, it gives a little texture. 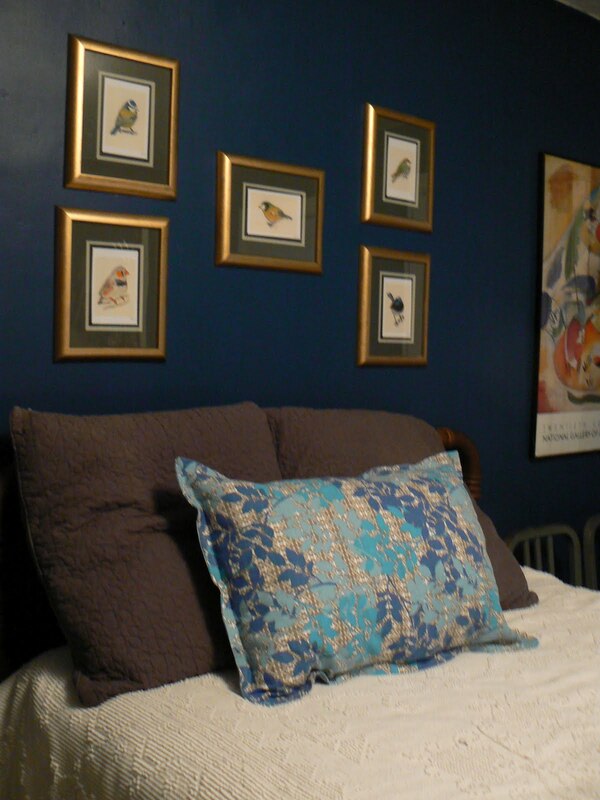 But a second coat with the pen would give it more solid gold color if that’s what you are going for. A pretty simple update to clearance frames if I do say so myself. 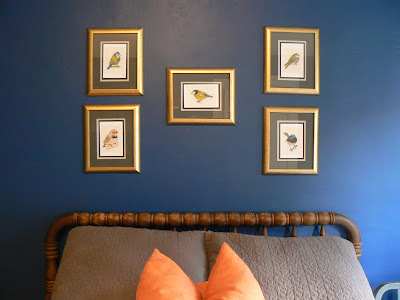 The frames plus the gold leaf pen and the art cost me a grand total of $55. Not bad for a five piece art collection.